Dérives is a association that develops, produces and distributes original documentaries. 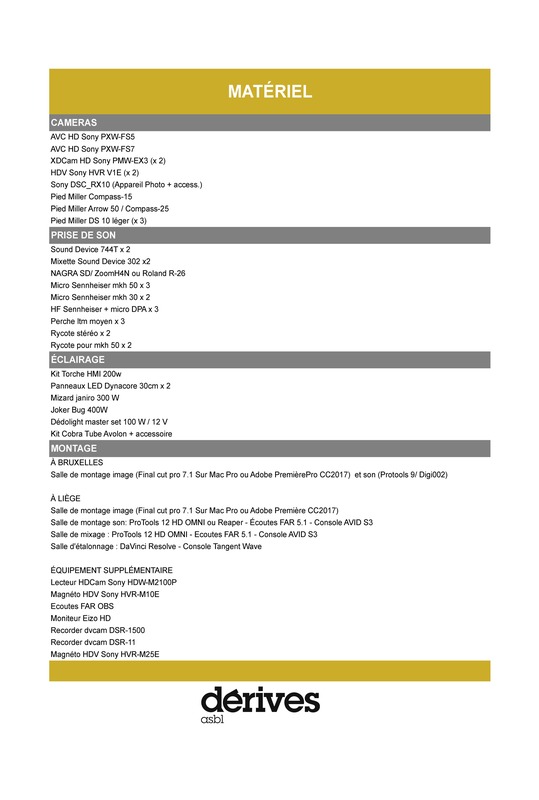 Dérives offers a number of aid systems to documentary filmmakers and producers from French-speaking Belgium, whatever the status of their project. Priority is given to first films, shorts and features, and to unfunded films, that view the world in an original and singular manner. 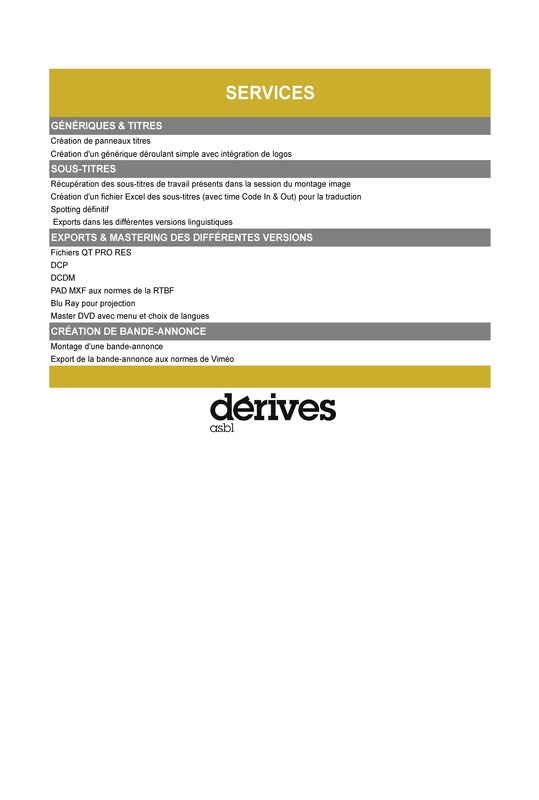 Dérives offers, as a producer, filmmakers who are directing their first or second documentary artistic, logistic and technical supervision: writing workshop, search for funding, financial structuring, availability of shooting and post-production equipment, collaboration with national and international partners. Our commitment to filmmakers aims to improve the quality and distribution potential of first films. Dérives helps certain projects that have been unable to obtain public funding for whatever reason by intervening on part or the whole of production and/or post-production. Dérives targets unconventional and alternative works that have an original and experimental cinematic approach. Dérives produces 2 to 3 documentary short films each year. This niche is as much for first films as for atypical projects by experienced filmmakers. The goal is to aid films that offer an uncompromising, powerful, committed and original approach. Dérives allots two aid grants each year to first documentaries: a development grant (4,000€) allowing a filmmaker to carry out scouting, and a completion grant (7,000€) designed to complete and promote a documentary film. 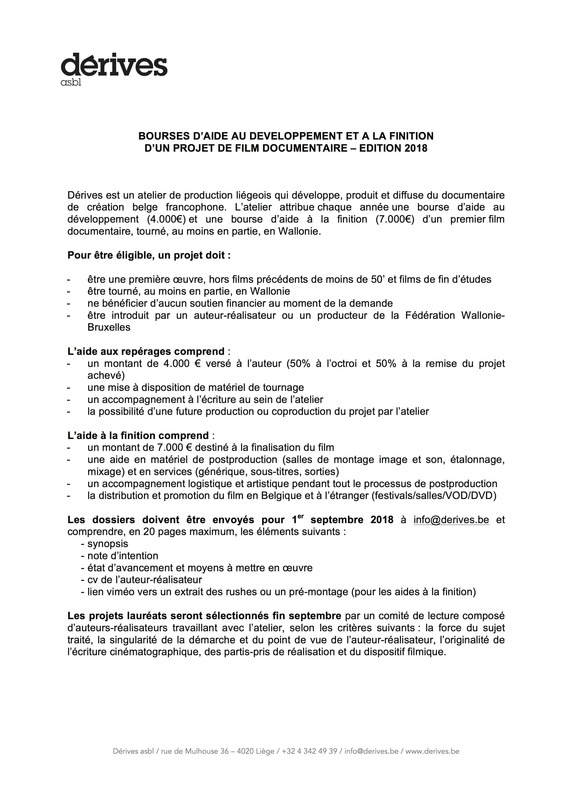 To be eligible, a project must be, at least in part, shot in Wallonia, be the work of a filmmaker from French-speaking Belgium and benefit from no other support when applying for aid. Each year, Dérives organizes project submissions on a specific theme (health, employment, education…) designed to launch a documentary film with the financial backing of local partners. The goal is to create and promote a film that has a new, creative and original view of a social problem while increasing public awareness of it. CV, synopsis, writer-director’s note of intent, status of the project and nature of the aid requested. Finally, all appropriate Vimeo links, be it to a previous work, a pre-cut or an extract from the rushes.